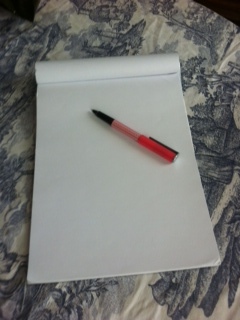 An empty white page. Beautiful. I love it…the potential, the wonder at what God is going to show me…open up to me as I write. Often I sit down at my computer with the intention of sharing a difficulty or struggle that God is bringing me through, but today I decided I just want to write. To share life. This past weekend I started an organization project. I thought it would take about 4 hours…oh my goodness did I underestimate! I’m on hour 47 and there is more to be done…how is that possible? My projects always ooze into other things and before I know it I’ve created complete chaos. I once saw a t-shirt that said, “Chaos, Madness, Mayhem…My Work Here Is Done” – I should have that t-shirt. Actually I think I should get that shirt for me and my children…we are excellent mess-makers. I need to finish this project. I can’t work in mess…I need clutter-free zones. Clutter takes me to bad places…like duck and cover mama’s gonna blow places. But I found a corner that is uncluttered and my children are all busy or sleeping, so I decided to ponder things…not sure what things yet. This is kind of stream of consciousness blogging…might be disastrous. I’m sitting in my favorite chair, Bible and laptop beside me, with a cooling down cup of coffee and hot cocoa (Yum!) on the windowsill next to me and praise music filling my ears. And I’m realizing how much I need this moment. This clutter-free, no to-do list moment. Life is cluttered in my head, in my heart, and in my home. There is so much to think about, feel, and do. If I just had more time to work through my thoughts, quietly ponder the Word, finish my projects… Sometimes the lack of time in my day is astonishing to me. I wake up with such hope for what I will accomplish, only to go to bed disappointed by a day spent in constant motion with very little to show for it. I wonder if I might want to consider that a bit more. Constant emotion. I feel like that might describe me well. I do feel like I’m in constant emotion. I’m always feeling something…well, I guess we all are always feeling something. God made us in His image…He feels therefore we do too! And these emotions aren’t bad, necessarily. It’s just that mine tend to swing all over the place and I tend to be ruled by them. I range from feelings of peace and acceptance to anxiety and confusion, anger to forgiveness, frustration to understanding, loneliness to longing for solitude, regret to trust, hope to fear…the list could go on and on…and amazingly I could probably feel all those emotions in a day…any day. Oh my goodness I AM in a state of constant emotion… I’d like these God-given emotions to display Christ’s character…not my craziness. And I again I come back to what God keeps reminding me…His good might not look like my good. His good might be more challenges and more struggles…but in His hands those challenges and struggles would be just what we need to grow in our faith and in our love of Him and each other. I know that, but oh how I pray that is not God’s plan for us. Most of the time my emotions are centered on my circumstances, my situation, my environment…I’m easily swayed emotionally by things not going as I planned…my house not looking as I hoped…my children not doing what I asked…wow, it is all about me isn’t it? But you know, sometimes life seems really hard. There hasn’t been a time in the past few years without some struggle going on. My prayer partner and I pray each year for an uneventful year. So far, not so much. We seem to go from one crisis, tragedy, and struggle to the next. But I can see that those difficult things, although overwhelming at times, do not represent my life. Just as my state of constant emotions does not need to be my identity. My identity is in Christ. I want to be defined by Christ. Remember that story of Jesus calming the storm? He was asleep in the boat while the disciples freaked out. In the past, I’ve wondered why He was asleep…it seems odd, maybe even a bit callous to the fear of the disciples. But I wonder if the reason might be to show us how much we can trust the Lord in the storm. Jesus was so confident in the Father’s care, he slept through the raging winds and crashing waves. He rested in the care of the Father while the storm raged on. I wanna be like that. I want to calmly be with my Lord as the storm rages on around me. I know I’m blessed even in the storm. I can see it as clearly as I can see the clutter in my office. The blessing of time spent with my children around the fire pit reading a great novel together. The blessing of dinner out with my girlfriends to celebrate a birthday. The blessing of a neighbor dropping off cookies just to love on us. The blessing of neighbors who invite my little girls over for dinner just for fun. The blessing of a sister who laughs at all my jokes. The blessing of hot coffee and cocoa in the morning. The blessing of a comfortable house. The blessing of family and friends who love me. The blessing of His word spread before me each day. 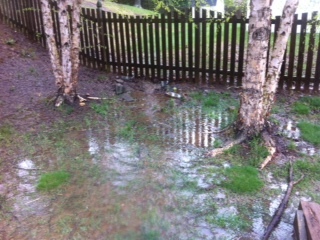 This week we had more rain than I can ever remember and my backyard became a rippling creek or I might even call it a small river…there was water everywhere in pools up to 6 inches deep. Our little English basement drain decided it was done draining and I feared a wet basement episode. I went out in my daughter’s rain boots and tried to figure out how to divert some of the water cascading through my yard…honestly, I was laughing most of the time. It was nuts! Sometimes those moments when things are just ridiculously awful, I can smile more than at the little annoyances of life. I even laughed when I slipped holding the bucket my kids had filled with “puppy presents” and forgotten to put in the trash…it was the most disgusting bucket of “water” you can imagine. I was carrying it back to the woods and unfortunately I slipped. The bucket and I had a face to face experience I would prefer never reliving! After my initial holler of “YUCK!!! !” I ran laughing to the sink to pour the hottest water possible all over my face…I seriously wanted to dip myself in bleach or Purell or something! Icky! Splashing poop water all over myself kinda put the whole backyard experience in perspective for me. I could angrily stomp around in the pools and puddles and fuss about the mess (and the poop water), or I could splash around laughing at the absurdity of it all. Adding to the silliness of the afternoon, my littlest daughter was outside sledding (yes sledding) down the muddy hill into the huge puddles. She was covered in mud…just like our two labs (so you can imagine what my house looks like…). It was pure joy! Pure muddy, filthy joy! Sometimes I miss participating in the joy-filled moments because I’m so busy doing…dare I say, so busy fussing. I wish I could remember that I NEVER regret stopping work to enjoy my children. NEVER. Today I’m determined to finish my project so that I can spend time tonight playing…maybe we’ll even splash in the mud again. I foresee it still being there. The trick is going to be letting myself look past the clutter in my house – to put aside the clutter of thoughts in my head – to overlook the clutter of feelings that overwhelm…and focus on the simplicity of time spent with my children. That is easier said than done, but I believe God will honor my desire to serve Him through loving my children…investing in them not just their surroundings. And I think focusing on the beautiful blessing of my children will really help with my mess of emotions…maybe I can change my constant state of emotion into something positive…something that is more a reflection of Christ than me. Glory in his holy name; let the hearts of those who seek the LORD rejoice! Seek the LORD and his strength; seek his presence continually!